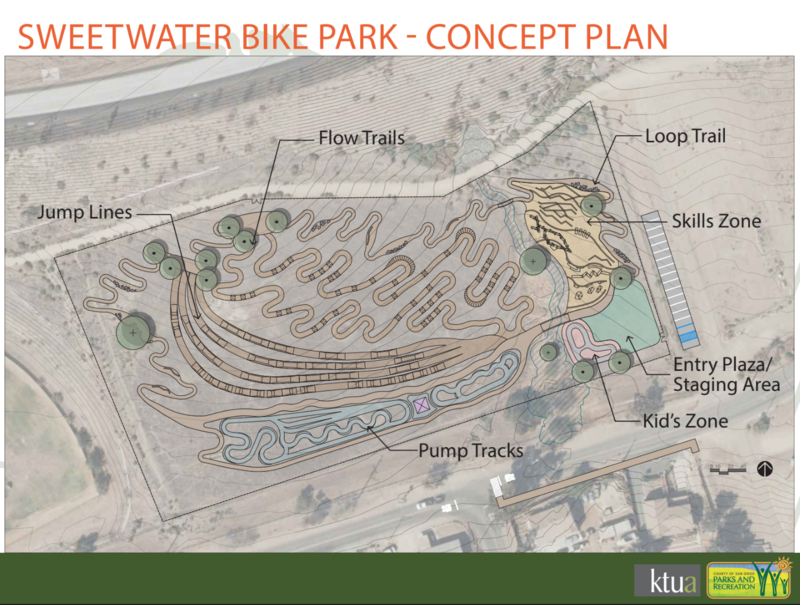 Winter 2019 Update: The County of San Diego has approved over $1,000,000 in the operational budget towards the Sweetwater Bike Skills Park. Two public community meetings were held in early 2018 to gather input from the public on this project. The conceptual design has been completed by KTUA and the contract has been awarded to S&B Engineering who will manage the build, and Schneider Grading will assist with some of the park’s technical components. Ground should break late Spring 2019. SDMBA promotes the sport of cycling for all people of all ages and skills. We believe that one of the best places to do this is at a Bike Skills Park. These next generation parks are popping up all around the country with great success. Bike Skills Parks promote a healthy, active lifestyle and create a vibrant community hub. Bike Skills Parks attract families, teens and riders of all abilities who want to practice their skills and meet others who share their passion. It not be an unusual sight to see a toddler on a balance bike next to a professional BMX riders followed by a mom and a daughter riding a the pump track together. Elements of a Bike Skills Park can include progressive skills elements, pump tracks, tot tracks, jump lines, and features. SDMBA is currently working in cooperation with the County of San Diego and Supervisor Greg Cox to bring such a facility to the region. The concept has been discussed in the area for years but real progress is now being made. As plans move forward for a Bike Skills Park, SDMBA is working closely with the County of San Diego Parks and Recreation Department and all stakeholders to ensure that the final product is a top notch facility. The support of community members, volunteers, and local and regional sponsors will be necessary to create a vibrant, world-class facility. A small pump track is being built by Pardee Homes and the City of San Diego at Pacific Highlands Ranch Park to open in mid 2019. The County of San Diego is actively working on plans for a small bike park in the Otay River Valley in partnership with the City of Chula Vista and is working on identifying appropriate sites in East and North Counties. SDMBA is actively supporting development of bike parks to the City of Carlsbad, the City of San Marcos, and the City of Chula Vista. The only public operating pump track currently in San Diego is at the Chula Vista Elite Athlete Training Center as part of Chula Vista BMX operated by Tyler Brown. Open limited hours so please check their hours of operation before visiting.